As thought might be the case, a litter pick was needed before planting could begin for the Incredible Edibles project outside County Hall. The Isle of Wight Climate Coalition are raising awareness of the catastrophic consequences for our planet from the damaging effects of global warming. See them in Newport on Saturday. Steven Goodman shares his views on the "avoidable damage being done to our hedgerows", businesses going plastic-free and those supporting farmers to recycle plastic waste. This reader believes "our political servants" should be doing more to "help rather than hinder" those who work had to ensure farming remains a part of the Island economy. 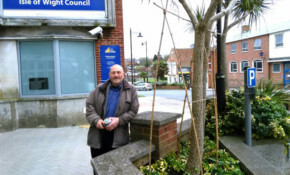 Steven Goodman invites readers to join him and others at the Frank James Hospital in East Cowes on Saturday to celebrate five years of campaigning to protect the former hospital - whilst those at the London event urge politicians to protect the NHS. Work at the former Frank James Hospital is delayed again, so there'll be another Big Gathering on Sunday 11th December, with interviews being filmed by David George. Following Red Funnel's Plan B approach to the expansion of their ferry terminal in East Cowes, one resident shares his ideas on a two phased approach. The group of volunteers who have been clearing and securing the former hospital in East Cowes for the past few years met again on Sunday. Steven Goodman reports back. Steven Goodman believes that following the rejection of Red Funnel's planning application to expand their terminal in East Cowes, they now have the opportunity to create something exceptional. On the fourth anniversary of when a handful of guerilla gardeners first entered the former hospital grounds to clear the overgrowth, the Friends of Frank James welcomed visitors to the grounds. Steve Goodman suggests that if Red Funnel are planning to relocate in order to find more parking, why not create car parking space above the existing area and clad it with vertical gardens? The long-awaited 'urgent works' have been completed and celebrations took place at the midsummer gathering on Sunday at Frank James Hospital.